When Ootake was a child, he went to a Go club near his house and played with many adults. In this Go club, there were some strong players. When I read his biography, I can infer that those strong players had a properly training, so they knew advanced tesuji and techniques. He also had a 5dan Go teacher (at that time, the rank of 5dan was equivalent to what we would today consider 7dan or higher). Under his tautologies, Otaka improved miraculously. Later on, he became an apprentice of Kitani Minoru 9dan. For example, Fukui Masaaki 9dan did not have a Go teacher when he was a child. He had only famous Honinbo Dosaku Games. Dosaku was once the strongest player during the Samurai period. Fukui played those games so many times that he eventually memorized all the games. 1. Most adults don’t have very good Go teachers. 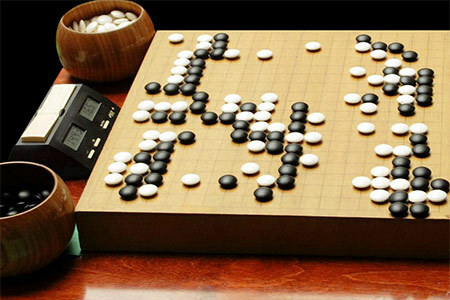 So they may study for years without learning proper tesuji, shape, joseki, etc. In my experience it takes adults a certain amount of time to learn just one tesuji; it may take up to a month. That’s not what happened with Ootake or Iyama. They could learn one tesuji and begin using it in their games immediately, and they would never forget it. The three American Go Association (AGA) regional Board of Director seats are up for election and with just over two weeks to go, no candidates have been nominated. The current terms of office expire this September. Nominations, including self-nominations may be made by full members for the region in which the member resides and must be received by June 15, 2015. Nominations and questions must be emailed to elections@usgo.org. Click here for complete election information and qualifications. Lee Hajin 3p, popularly known on YouTube as Haylee, will record one of her signature play-and-explain games at the US Go Congress, the AGA announced. Though the exact format is still to be determined, her opposition will include fellow YouTube broadcaster Nick Sibicky, possibly as part of a team, said AGA VP of Operations Andrew Jackson. “The idea is we stream Hajin in one room telling us about her game while the opponents are debating their fate in another room, probably also recorded. We’ll edit the two videos together later to put on YouTube.” This year’s Congress runs August 1-9 in St Paul, MN. In her videos, Hajin records as she plays a random player on Tygem, explaining her moves and thinking as she goes along. In Haylee’s gentle but disciplined playing style, games usually proceed rather quietly until her opponent — generally a very strong player — makes a modest mistake and their game disintegrates like an airplane whose rivets turn out to have been made of putty. Lee, a frequent Go Congress attendee, does the Haylee videos as a sideline to her current job as Secretary General of the International Go Federation. She has more than 2,800 subscribers and 214,000 views for her 90 videos. Nick Sibicky started his YouTube channel with recordings of his DDK lessons at the Seattle Go Center, and they have grown in popularity, reaching nearly 9,000 subscribers with more than three quarters of a million views. Mexico City triumphed over Portland, OR in a friendly children’s tourney held May 16th on KGS, reports organizer Peter Freedman. Each city fielded a team of six children, ranked from 10-21k. They participated in a three-round tournament using 19×19 boards and KGS handicaps. “Luke Helprin’s parents hosted the Portland team at their house, and his dad Ted graciously provided snacks and helped with Spanish,” said Freedman. Portland got off to a good start in round one by winning 4 out of 6 games. Round two was a tie with each team winning 3 matches, setting the stage for a decisive showdown. In the third round, Mexico City came up from behind by winning 5 out of 6 matches. -Austin Freeman with Paul Barchilon. Photo by Siddhartha Avila: Members of the Mexican team Skyping with Portland. Winners Report: Overall Wins: Mexico 10, Portland 8; 3 game winner: Luke Helprin 20k; 2 game winners: Hikaru Saito 10k, Diego Ali Manjarrez 14k, Leonardo Valdovinos 14k, Daniela Luciano 22k, Almudena Espinosa 21k.